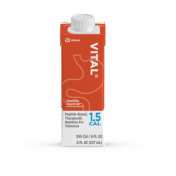 VITAL AF 1.2 CAL is Advanced Formula therapeutic elemental nutrition with ingredients to help manage inflammation and symptoms of GI intolerance. 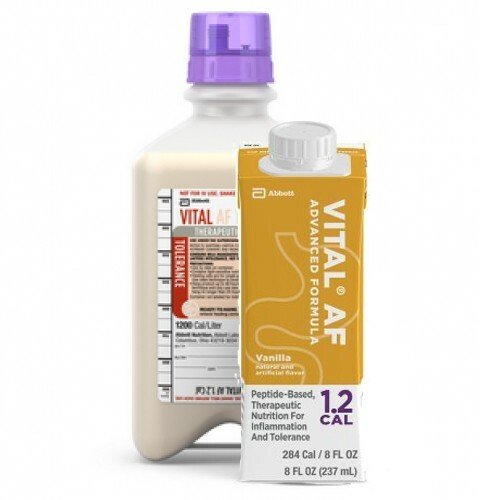 VITAL AF 1.2 Cal is an Advanced Formula therapeutic elemental nutrition with a specialized formula to manage inflammation and symptoms of GI intolerance. It promotes tolerance by using well-tolerated and well absorbed fats from fish oil to get the best absorption of important fatty acids. Refined fish oil Eicosapentaenoic acid (EPA) and docosahexaenoic acid (DHA) helps regulate inflammation and is important to boosting the immune system. Hydrolyzed peptide-based protein also promotes tolerance and Abbott Nutrition uses prebiotic fiber NutraFlora® scFOS® developed to promote growth of good bacteria for optimal colon health. 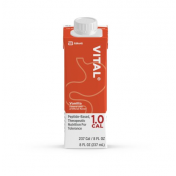 Vital AF 1.2 Cal also supports wound healing with high protein content that's beneficial for patients with metabolic stress. Critically ill patients will benefit from increased levels of vitamin D that supports tissues such as heart muscle and brain cells as well as regulates cell growth and development, immune function, and metabolic control. An increased amount of antioxidant vitamins C and vitamin E removes free radicals that cause cell damage. The formula also has 24 essential vitamins and minerals for well-rounded sole-source nutrition. Feeding sets cannot be shared and should only be for single-patient use only to avoid contamination. Do not consume if you have galactosemia. Always use careful and safe handling procedures.